A teenager said he sought retribution after being hospitalised in a drug-related incident. Connor Jackson was found with a knuckleduster in his trouser pocket. He told police he had found it. “He had been hospitalised due to a drug-related incident,” explained procurator fiscal Graham Fraser, “and there was some concern that he may be seeking retribution. “Police saw the accused at about 2.30am, and started chatting to him. He was intoxicated and said that he was angry about what had happened,” continued Mr Fraser. 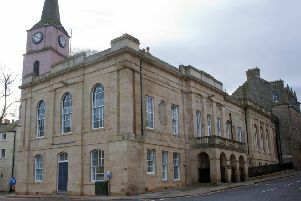 Defence solicitor Ross Dow told Jedburgh Sheriff Court that the offence was “a source of regret” to his client. “This person has been remanded in relation to these drugs, and my client was not the only one who ended up in hospital,” explained Mr Dow. “He said he has learned his lesson and will not be taking drugs again,” said Mr Dow. Jackson, 18, of Teviotdale Court, admitted having an offensive weapon – a knuckleduster – in Dovemount Place on August 23. Sheriff Kevin Drummond told him: “You were found drunk, in possession of a knuckle-duster, looking for someone.” He sentenced Jackson to a 12-month Community Payback Order with 100 hours of unpaid work.